Velázquez is born in Seville in the year 1599. His mother came from the Spanish lesser nobility, which allowed his son to be educated in languages and philosophy. Although soon they realized that the kid was gifted in art, because, with 12 years, he was studying with an acknowledged painter. In April of 1622, with 23 years, Velázquez goes to Madrid and, just by chance, in December of that year, the favorite painter of the court of Phillip IV, dies. The young artist, with leverage inside the royal house, is invited to work for one of the king’s ministers and, only a year after, Phillip IV was already posing for him. He finishes a sketch in just a day and the king, pleased with the result, entitles Velázquez as the “Official painter of the king”. In 1625, Breda, city occupied by the Netherlands, is besieged by the Spanish army commanded by General Ambrosio Spinola. Despite being a fortified city, considered impossible to conquer, Spinola succeeds and returns triumphant to Madrid. Once in the Spanish city, the artist and the general meet and immediately became great friends. Sometime after, they go together to Italy, birthplace of the general. It is said that, there, the artist studies the great masters and that his style begins to be more realist and detailed. 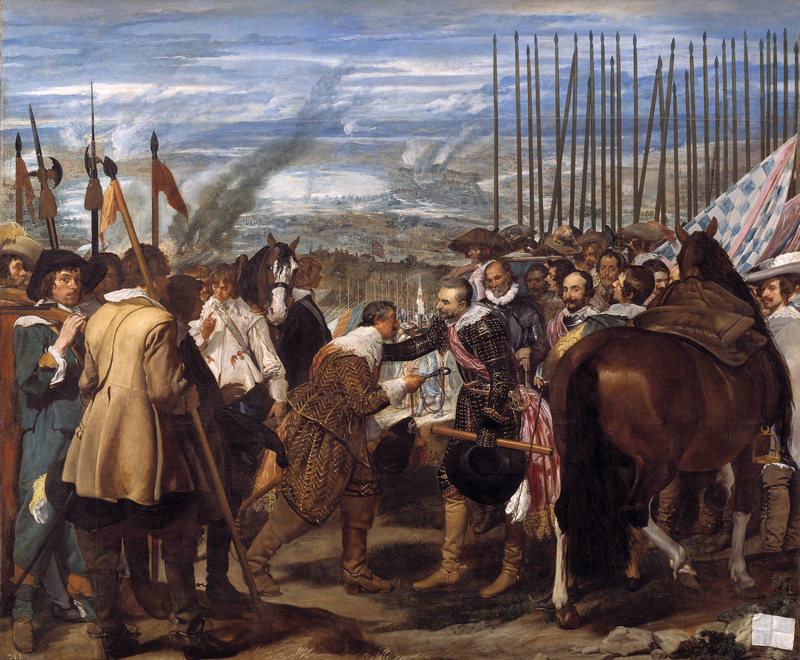 Years later, general Spinola dies and, although many think that The surrender of Breda, from 1635, is a painting to highlight the Spanish nationalism, it seems more plausible the version that says that, simply, is a tribute from Velázquez to his friend, who had just died; because, by the way, in the year that Velázquez was painting the canvas, Breda was already taken back by the Dutch. The painting shows us the third day after the battle between Spain and the Netherlands, where the commander of the Dutch army, Justin Nassau, handles the keys of the city to Spinola. The work is not focused on the battle itself, but rather in the reconciliation. The orders of the victorious Spinola to his army where not to mock their enemies and to behave like gentlemen. That’s why both armies, the Spanish on the right and the Dutch on the left, although days before were killing each other in battle, here they share a tranquil atmosphere, which contrasts with the smoke coming up from fires at the background. This work is acknowledged as being one of the few Velázquez’ historical paintings. Besides, the close relationship between the artist and the general makes us guess that Spinola would have tell the artist what happened in Breda in a detailed manner, which makes this painting historically precise. ~ by Álvaro Mazzino on November 25, 2010. This entry was posted on November 25, 2010 at 10:11 and is filed under Baroque.You can follow any responses to this entry through the RSS 2.0 feed.You can leave a response, or trackback from your own site.